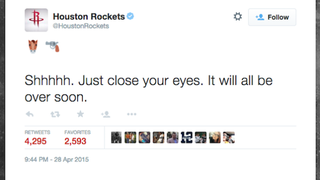 The Rockets’ Twitter account sent out a tweet Tuesday night as the team played Game 5 against the Mavericks, which showed a gun to a horse’s head in emoji, along with, “Shhhhh. Just close your eyes. It will all be over soon.” (Houston was in the process of eliminating Dallas.) The tweet was deleted shortly after, and Chad Shanks, the digital communications manager behind the tweet, was apparently fired today. “I never meant to offend anybody,” Shanks said. “I attempted an admittedly edgy jab at the Mavericks’ expense and it did not go over well with everyone. The organization supported my efforts to make the account one of the best in the NBA by pushing the envelope, but they deemed this too far. The tweet wasn’t that bad.